I have to confess as I begin this that I am having trouble figuring out where to begin. 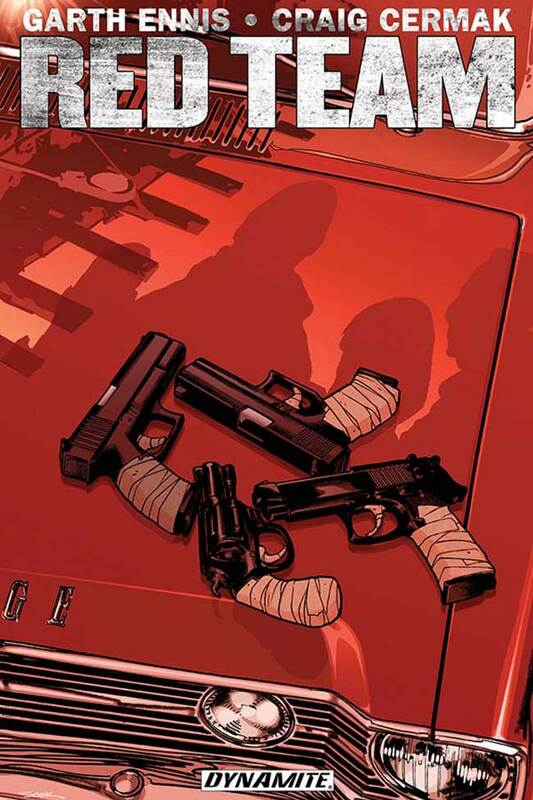 There are so many great things that I want to say about the conclusion to and overall run of Garth Ennis and Craig Cermak’s Red Team now that issue #7 is out, however I also do not want to give too much away. Because really – and I know I say this a lot but really – you need to read this book. Anyone who reads this column regularly and has caught the two issues thus far of Drinking with Comics (number three coming next week!) has probably realized that I could talk about David Lapham’s Stray Bullets forever. So there is probably little surprise that the topic of this week’s piece is my reaction to the release of the long-awaited Stray Bullets #41 and the first issue of Stray Bullets: Killers. However, instead of just talking about the books what I thought I’d do is personalize this a bit and try to recreate in words just how much the release of these two books meant to me. Have you ever had an experience that completely humbled you? Probably. We all get them from time to time, the dividing line being between those who pay attention to these occurrences and try to integrate them into their lives as a source of betterment, and those who simply shirk them off, preferring to leave their lives unchanged. I for one try to pay attention, and I will tell you now that earlier today when I set out to do a little research for this week’s column I had one of those experiences, quite unexpectedly. Here all I set out to do was tell you about a new comic called A Voice in the Dark that I am absolutely CRAZY about when I encountered the story of a man that inspired me in ways I cannot even begin to describe. The man’s name is Larime Taylor and he is the creator/writer/artist/letterer of A Voice in The Dark. With the tsunami of excitement surrounding the announcement a few weeks ago that Seth Rogen and Evan Goldberg have been greenlit by AMC to bring Garth Ennis and Steven Dillon’s PREACHER to the small screen I decided the time was almost right for a re-reading. It’s been about five years since the last one so I’m due anyway, excitement surrounding this news or not. However, I say ‘almost’ because there is another book I wanted to re-read first, one that I haven’t revisited since about 2001 and its been on my mind for awhile now. That book is Garth Ennis and Phil Winslade’s 8-issue mini series GODDESS. Ah, William William William. You just cannot stay away from the things that go bump in the night for very long, can you? Certainly not now that Mike Wolfer has launched Gravel: Combat Magician with Avatar Press. And if Gravel’s going to get sucked back into the Dark Arts and those that use them for their benefit, you can bet the blood is going to flow and the magic is going to be eldritch and dark. Good. I like my magic dark.